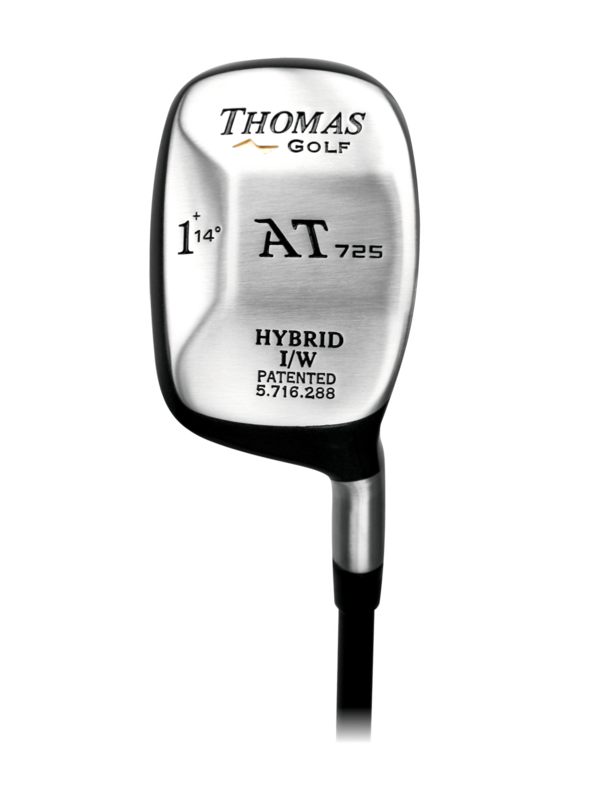 Now golf hybrid clubs, similar to this Thomas golf hybrid club I have here. They've been on the market now for quite a while, and they're not necessarily new to the golf scene anymore. But they're still a few golfers that are slow to adapt these into their bags and certainly some golfers that could do with more than they have in their bag. Most golfers now probably just got one in, but some people almost have it in just because everyone else has got one in. And actually a lot of golfers could benefit from having more than one, two, three, four hybrid clubs in their bag. Some people even adopt the entire set of hybrid clubs if they like the confidence giving shape and how easily they find the ball to go up into the air. But a hybrid club can be quite a versatile club for a number of reasons in your bag. Let's just kind of cover off a few of those reasons. Now initially people put them in their bags because they don't like hitting their long irons. So people might put a 3, 4, 5 hybrid in their bag because they don't like those irons and that's fine. That's a great reason. Now we can look at, well, what does that club then give us. So, let's say for example my 5 hybrid here. My 5 hybrid I find quite useful if I'm playing into a long par 3. Now, ideally par 3 is going to have bunkers around them, relatively small greens and something where we need to try and stop the ball on the green. So, a hybrid club is perfect because it flies the ball in nice and high with enough backspin to bring the ball to standstill on the green whereas a long iron equivalent might have been too low and rolling off the back of the green. I also find hybrid clubs quite versatile and useful on tight par 4s. So, shortish holes, where I don't need to hit the ball a million miles, but I do have danger and hazards to aim at, or to avoid should I say. And a hybrid club generally makes a bit more back spin on the shot and makes it easier to keep it nice and straight. I also like my hybrid club on par 5s when I'm trying to hit a long second shot down there, or even potentially going for the green on a par 5. I want a club that's going to go a long way, but still give me a decent amount of control that I can land the ball on or close to the green and get the ball to spin and stop fairly quickly. Now other more sort of bizarre uses for hybrid clubs a lot of clubs don't necessarily identify is they're great for bump-and-run shots. So around the side of the green if you just need to pop the ball forwards and run it, the type of thing where a lot of golfers might putt from the side of the green or hit a 7 iron a hybrid club is perfectly suited for that little bump shot around the side of the green and then it trickles out towards the hole. The benefits of that is it's got enough loft to lift it over the fringe, but not so much loft that it's going to stop when it lands. It's going to roll out which is sometimes a benefit. The club is also nicely rounded on its sole design, so it's not designed to dig in to the surface. It's designed just to skim through the grass and roll the ball out. So, it's very versatile for that. We also quite like this club if I'm ever in the trees, which I'm occasionally and I can hit the club out nice and low and jab it forwards and get it running and again the sole design is such that it's not designed to dig into the surface. So those are some of the benefits of utilizing hybrid clubs in your bag. If you've got one in your bag, then that's great. But consider the options of maybe adding more hybrids to your game to ultimately improve your skills.